Invisalign Teen in Glasgow is a treatment that has been specifically developed for teenage patients. The treatment works in exactly the same way as Invisalign braces but has additional features, which make it suitable for younger patients. The Invisalign system works by using clear, plastic aligners to move the teeth that are custom-made to fit the patient. The series of aligners are manufactured in accordance with the specific orthodontic problems, in order to ensure the teeth move in the right direction. Each aligner is worn for two weeks and then replaced with the next aligner in the series. The Invisalign Teen aligners have markers on them to remind patients when to change their aligner and replace it with the next in the series. The teen treatment also comes with spare aligners so that treatment can continue if an aligner is lost or damaged. The treatment works by generating gentle force, which moves the teeth in the desired direction. The treatment involves wearing a series of clear, plastic aligners. The aligners are designed to fit the individual patient and they are shaped to move the teeth into the correct position over the course of time. The aligners are worn for two weeks and then replaced with the next in the series; each aligner should be worn for a minimum of 21 hours each day. 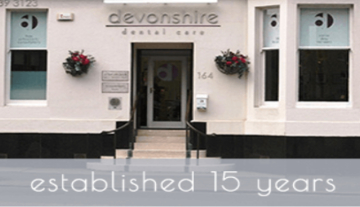 During the initial consultation here at Devonshire Dental Care in Glasgow, the dentist will check that the patient is a suitable candidate for the treatment and explain what the treatment involves and how long it will take. The dentist will then create a mould of the patient’s teeth and take images, which will be converted into 3D images. The images will be used to determine the treatment pathway and track the movement of the teeth over the course of the treatment. The plan and the images will then be used to manufacture the aligners at the laboratory in America. When the aligners have been manufactured, they will be sent back to the dentist and given to the patient. The dentist will check the fit and then the patient will start their treatment. The aligners must be worn for a minimum of 21 hours each day. Each aligner should be worn for two weeks and then replaced with the next aligner in the series. Invisalign Teen has numerous benefits. The main advantage is that the braces are clear and very discreet, which means patients don’t have to worry about their appearance during the treatment. For most teenagers, image is very important so the Invisalign aligners are preferable to traditional braces. Invisalign teen braces are also removable, which means you can eat and drink anything you want. The removable nature also means that you can clean your teeth thoroughly, which will promote good oral health. The braces are also much more comfortable than conventional braces. The Teen aligners also come with spare aligners and markers on, which help to remind patients when to change their aligners. How do the braces work? The Invisalign Teen system works by moving the teeth gradually over the course of the treatment time. The aligners generate gentle pressure, which pushes the teeth into the correct position, resulting in a straight, attractive smile. Each aligner has to be worn for two weeks and then replaced with the next aligner in the series. The aligners are custom-made to fit the patient’s mouth exactly. The price of this treatment starts from £1250.00. Treatment time will vary according to the complexity of the individual case. Most cases take between six and twelve months but more complex cases may take a little longer. Invisalign Teen aligners are much more comfortable than traditional metal braces because they are made from plastic and designed to fit the contours of the patient’s mouth exactly. The forces generated by the aligners are also gentler than conventional metal braces and there are no wires which need tightening; often, tightening the wires can be very painful for orthodontic patients. Is Invisalign Teen suitable for all teenagers? Invisalign Teen braces are suitable for most orthodontic cases. The braces have been specially designed for teenagers and are suitable for those with teeth which are still erupting, as well as those who already have all their adult teeth. The treatment can be used for patients with crooked or twisted teeth, poorly positioned teeth, gaps between the teeth and crowded teeth. How long do I have to wear the braces for? You will be advised to wear each aligner for two weeks and then replace it with the next one in the series. The number of aligners you wear will depend on the complexity of your case (more complex cases require more aligners). You need to wear your aligners for at least 22 hours each day to ensure the treatment is effective. Why should I choose Invisalign Teen? Invisalign is a perfect treatment for patients who are worried about their appearance when wearing braces; most teenagers are already worried about their appearance, without having to worry about wearing big metal braces for long periods of time. Invisalign Teen braces are discreet and virtually invisible to everyone else, meaning that you can get the smile you always wanted without having to worry about the way you look during the treatment. The aligners are also more comfortable than traditional braces and treatment time is usually shorter. How is Invisalign Teen different to Invisalign? Invisalign Teen has been developed especially for teenagers and has a number of features, which make it more suitable for younger patients. The Invisalign Teen aligners come with several spare aligners, to ensure that treatment can continue if an aligner is lost or misplaced. The aligners are also marked with special tabs, which show when the aligner needs to be replaced with the next one in the series; this helps patients to remember to change their aligner. The additional features are designed to make it easier for teenagers and dentists to keep track of the treatment and keep an eye on progress.